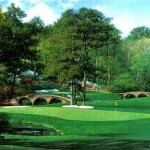 This beautiful reproduction of “The 11th at Augusta” by Larry Dyke has beautiful color and detail. Lovely for you home or office. This giclee on canvas is from the original painting by Larry Dyke. 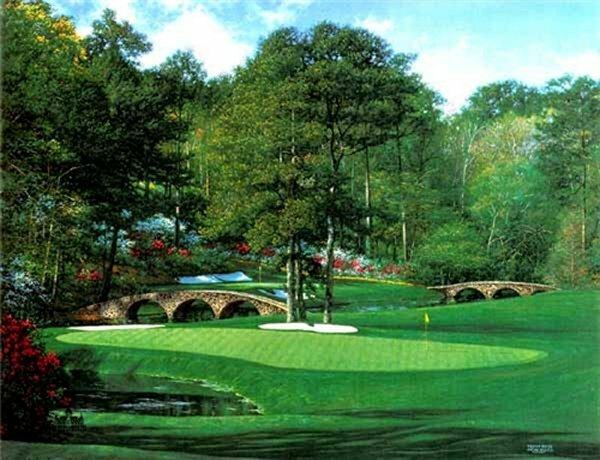 The 11th hole at Augusta National is the first in the Amen Corner, a series of 3 holes that bring the golfer face to face with his weakness. This piece is signed by artist, is a stretched canvas and is unframed. A devotion to his Christian beliefs is the driving force guiding Dyke’s life. 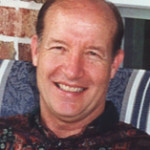 Read more about Larry Dyke here.